Mottainai literally means “what a waste” in Japanese, but besides using it as an expression, it is also a tradition, a culture, a philosophy and a lifestyle to the Japanese. In brief, mottainai encompasses the “don’t waste”, “utilise as much as you can”, “reduce, recycle, reuse”, “respect”, and “be thankful” values. So what does this has to do with today’s post? This post is about okara – also known as soy pulp of tofu dregs, okara is the by-product of soy milk, which I used to carelessly throw it away every time after I make a batch of soy milk. Nowadays, I try to find ways to use it up – previously in a chocolate cake, and this time in an okara croquette. A croquette is made by shaping mashed potato into a cylinder or a disk, dip into flour, egg and breadcrumbs, and then deep-fried. Sautéed minced meat and vegetables (like onion, carrot and mushrooms), and egg (as a binder) are commonly added in. The potato mixture can also be used to wrap a filling like cheese or hard-boiled eggs. This okara croquette does not contain any potato – which makes making it a lot easier as I don’t have to go through the process of steaming/boiling and mashing potatoes. And I have to say it tastes as good as the normal potato croquette! I made a sriracha-mayonnaise dip to go with it – this dip is just soooo good with fried food! Combine fresh okara and sautéed meat and vegetables mixture and season well with salt and pepper. The okara should be placed in a cheesecloth and squeezed until quite dry – otherwise the okara croquette will not hold its shape. If the croquette mixture ends up too crumbly, moisten with a little milk/soy milk. Divide the croquette mixture into 8 and shape each portion into a log or a disc. 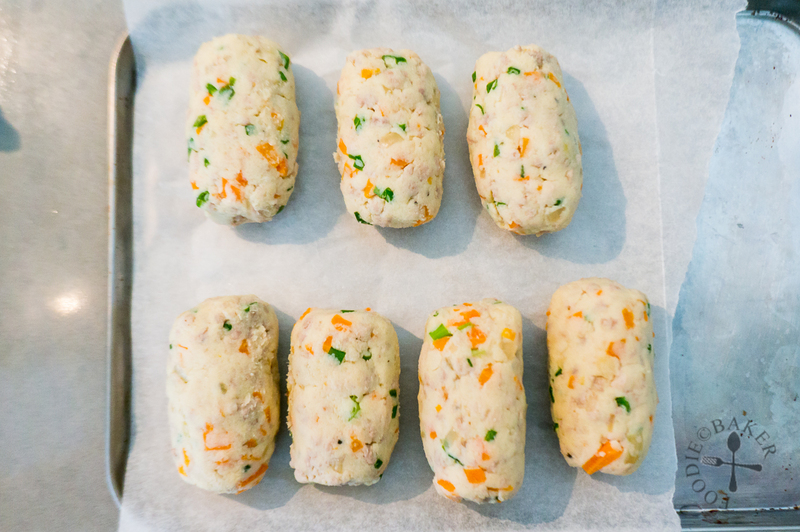 The shaped croquette can be chilled until ready for frying. Heat 1-inch thick of oil in a small pot over medium heat. 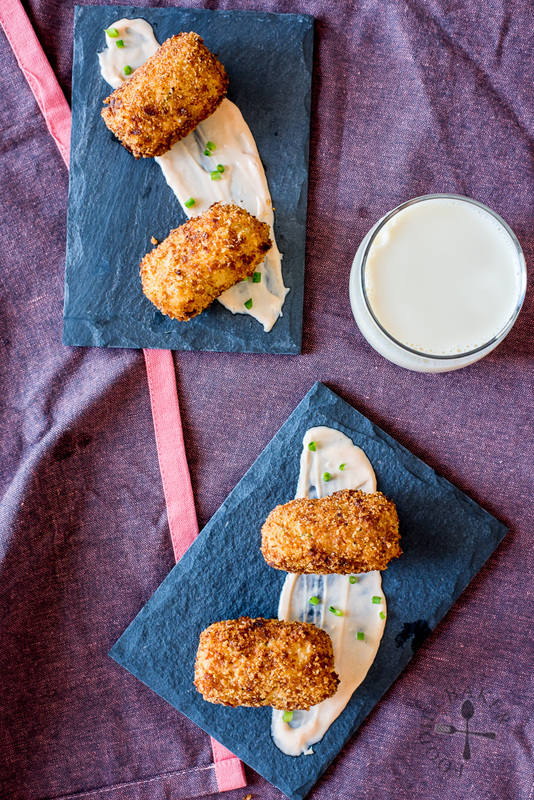 Coat each croquette in flour, beaten egg and then breadcrumbs. Deep-fry until golden-brown on all sides. Dig in with the spicy mayonnaise dip! Heat oil in a frying pan over medium heat. Add in onion and carrot and cook until onion is soft and translucent. Add in garlic and cook until fragrant. 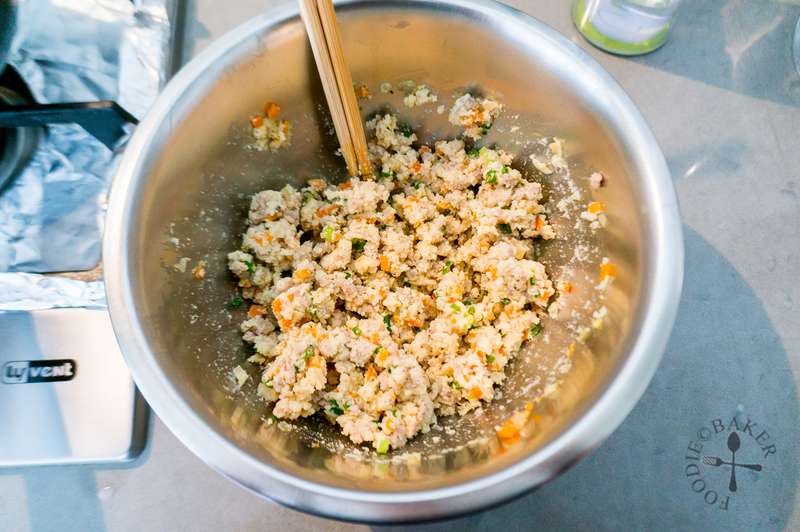 Make a hole in the center and add in the minced pork. Cook, breaking up the minced pork into small pieces, until the minced pork is no longer pink. Season with Worcestershire, mirin, salt and freshly ground black pepper. Cook until the sauce has been absorbed - the mixture should be moist but not wet. Remove from heat and let cool completely. Combine the meat mixture and okara in a bowl. Mix well with a large spoon or with your hand. Divide into 8 portions and shape each portion into a log. At this point the croquettes can be chilled in the refrigerator until ready for frying. Heat 1-inch thick of oil in a small pot (so lesser oil is needed) over medium heat. 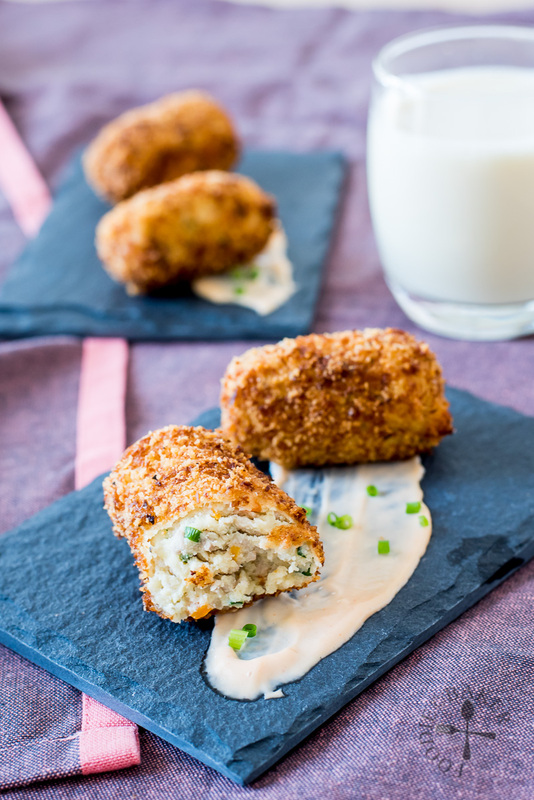 Dip each croquette into flour, then into egg, then into breadcrumbs. 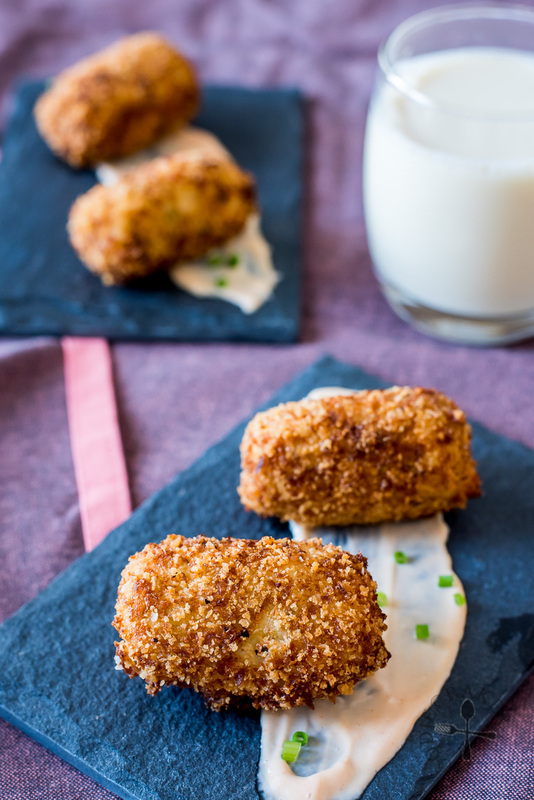 Deep-fry the croquettes in batches until golden-brown. 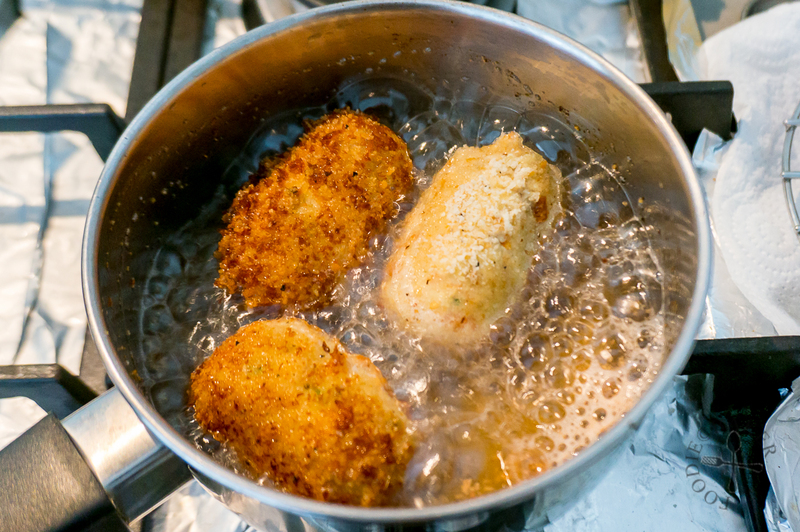 Remove the croquettes with a slotted spoon and place on paper towels to drain off excess oil. The croquettes are best served hot! Whisk mayonnaise and sriracha in a small bowl. Adjust the spiciness by adding as much sriracha as you like. - The okara should be placed in a cheesecloth and squeezed until quite dry - otherwise the okara croquette will not hold its shape. If the croquette mixture ends up too crumbly, moisten with a little milk/soy milk. Hey! There is no mayo recipe at the end (ingredients) plz share! These look amazing. Will be sure to make them next time I whip up a batch of soy milk. Thank you ! Hi Ellie, thanks for pointing it out! 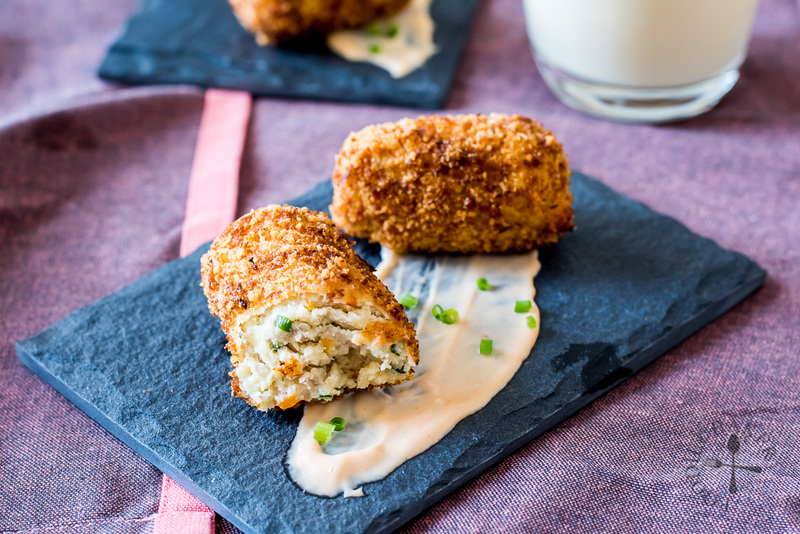 It’s actually a really easy mix of mayonnaise and sriracha 😉 Hope you will enjoy these croquettes too! Haha! Amazing. Next step will be to make our own mayo and sriracha eh? I make a vegan flaxseed mayo with oil water, salt and a splash of vinegar which works great actually. As for the sriracha, waiting to find the right chillies or til I can grow them myself! Still haven’t made these yet but am sure they’re gonna be amazing – thank you for replying and reminding me!! I love all these okara recipes you are sharing, I really must try this out. These look lovely. I’d need to leave the pork out and go for a vegetarian alternative but otherwise they sound fab.